This is the second short story based in Tyler’s Jakkattu Vector world. A very well written tale highlighting the difficulties of two Mezna/Human hybrid children. How long can they keep the Mezna part of themselves hidden, whilst living as humans? In a set of twins, is one more likely to show their true identity more than the other one? I found myself thinking about the issues raised in this story with relation to human children whose parents came from different castes/tribes/colours/races when this was unacceptable. These children often felt that they were ‘lost’ and did not understand who they were or what they would go through as neither side would take them in due to the intolerance involved. As with this tale, who do they turn to when they need help concerning either side of their ‘oneness’? 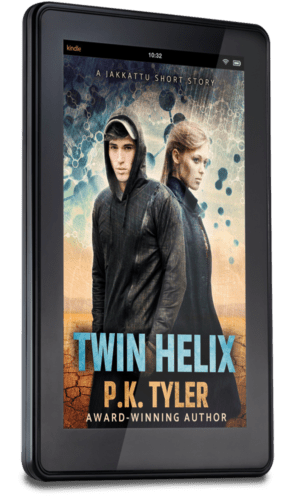 As usual, PK Tyler gives the reader a strong, sad, but entertaining, story in a SciFi world that is so full of potential, but also makes the reader think about their own world and the disparities within, whether ancient or modern. I really can’t wait to see how this series progresses.